Piedmontese wines are classified among the most famous and valuable wines worldwide known. Wine production in Piemonte is not as cospicuous as in other areas of Italy, but the region however offers a wide variety of doc and docg wines (they are more than 70). 90% of white wines and 75% of red wines have been certified, making Piemonte the first region in Italy in terms of quality of wine production. Wine tradition has very ancient origins here, despite the lack of space for grape growing - that is generally carried out on the hills - a feature that Piedmontese people have turned to their advantage since the amount of wine produced is scaled to maintain quality. Each single province in Piemonte is famous for the production of a particular type of wine that generally stands out for a special climatic characteristic and for a specific cultivation technique. 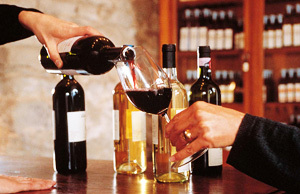 The province of Turin presents a wide variety of production, from red to dry or sweet white wines. Doc certified wines produced here Barbera, Erbaluce di Caruso (a good white wine produced in the Canavese area, on the hills between Biella and Turin) and Freisa. The most famous Piedmontese wine is undoubtely, the Barolo, produced in the South-west of Alba, in the so-called Langa del Barolo. It's a wine with unique characteristics that are due to the comlex geological profile of the area. Its history is important: already in 18th century it was beloved everywhere in Europe and in the beginning of 19th century, it began to be produced with the present characteristics. Thanks to the organoleptic characteristics and to its great structure, Barolo revealed itself immediately as a wine suitable for obsolescence and for export. Its European success took it in 1908 to the edge of the origin area and, in 1934, to the establishment of "Consorzio di Tutela" together with Barbaresco; in 1966 it was credited as a Doc wine ("Denominazione di Origine Controllata", that it means, "certified as first-class product"), and in 1980 it became also DOCG (that is a checked and guaranteed origin name). Cesare Pavese said: "Tre nasi sono quel che ci vuole per il Barolo'' ("Barolo needs to be smelt by three different noses"). Barolo finds its right match with dishes as roasted red meat, pot roast, bird, game, dishes with truffle and well-aged cheese. The most notable and traditional recipes are the Brasato with Barolo, the Risotto with Barolo, the Veal with Barolo, Piemonte' eel with Barolo and the Stracotto with Barolo. In honour of the Barolo, the region organizes many town festivals and parties, as the Festa del barolo (Barolo's Day) which takes place in September in the homonym town. It's an ancient delicate Piemonte's wine, around 12 degrees with a ruby red colour, and it's obtained by a wine grape called Bonarda piemontese. It is produced almost in the whole Piemonte, but most of all in the area in the south of the Alps between Turin and Novara and in the Monferrato, which is a hill part of the region of Piemonte. This very ancient ruby red wine (the name dates back before the year 1000) is between the most drunk wines in Piemonte and it is also quoted in the classic Italian literature by great poets as Giosue Carducci and Giovanni Pascoli. There are 4 different DOC typologies: Barbera d'Alba, with a dry and a little bit acid flavour, of an alcoholic gradation of 12 degrees and at least one-year-aged ; Barbera d'Asti, this too with dry and acid flavour, of at least 12,5 degrees and one-year-aged; Barbera dei Colli Tortonesi, dry, spirited and strong wine, of at least 12 degrees, it can be produced, besides with the Barbera's grapes, also with a 15% of Freisa's, Bonarda's and Dolcetto's grapes; finally Barbera del Monferrato, of blood red colour and of dry flavour, made with Barbera grapes from 75 to 90% and an addition of Freisa, Grignolino and Dolcetto grapes, can be slightly sparkling; it can be drunk "young", that is already the following year after the grape harvest. It's a dark-red wine whose name comes from French fraise (strawberry), its smell. Two different varieties exist: the sweet one and the dry one, but both were born from the homonym grape and can be drunk the year after the grape harvest. During the plague pestilences of 16th century, in Chieri it was used as the only remedy against the contagion. It comes from two different origin areas, Asti and Chieri: the Freisa d'Asti has a garnet-red colour or also a light cherry red and a decisive raspberry perfume (and taste too); Freisa of Chieri in the colour tends to the not too much intensive ruby and when it's "young" has a slightly acid taste, which becomes softer getting older. Erbaluce, also called Albaluce, is a white wine obtained from the homonym grape, overgrowed in the area of Caluso and of the lake of Candia, in the province of Turin. Although it's really sought-after by wine experts for its good qualities of wine for meals, nowadays it's a not very famous wine. Erbaluce has a straw yellow colour, a sharp and fresh taste, usually reaches 11 degrees and it is drunk by its first year of life. The Piemonte's Malvasie are red, sweet, fragrant slightly aromatic wines. Around the name's origins exist a legend: in the feudalism age, a certain Adimaro, colonist of the liege lord of Nus, was surprised by the latter while he was taking some wine for the parish priest into the church, obtained by a farmed vineyard, but the landowner was unaware of this. The liege lord wanted to know what kind of liquid it was, and Adimaro answered: "mauve juice". The landowner didn't believe him, and wanted to taste it; then Adimaro, being scared of his anger, invoked a miracle: "may the mauve be, please, my God", and the wine really turned into mauve juice; From then onwards, it would remain the name "malva - sia" (that is, "mauve - be"). Malvasia di Casorzo can be produced with additions until 10% to the Malvasia grape and it has a ruby red or a cherry red colour; Malvasia di Castelnuovo Don Bosco is made with the Malvasia grape of Schierano with addition of Freisa and is cherry-red-coloured; both wines don't go over 10,5 degrees and not all are developped in alcohol, but it still has a sugar content (some sparkling wine varieties also exist); usually it must be drunk the year after the grape harvest. According to the tradition, the Passito di Caluso was born in Canavese in the first centuries after the year 1000, because in that period the "Greek wine" was greeted enthusiastically, a type of a sweet and strongly aromatic wine rich of alcohol; the Piemonte's producers began in this way to farm suitable vineyards and still today in Piemonte many vineyards are called "Greek". It's the only wine in Italy which needs at least six months to naturally wither (that is, with no straining), from the first days of september to the end of february of the year after the grape harvest, then the bunches are arranged or hanged up on the threads, and only after 4 years of obsolescence, and 5 for the "stock" it can be sold and drunk. Caluso Passito, moreover, is one of the few wines which hold up obsolescence: a Caluso Passito of over 50 years ago still preserves all its qualities. It has a golden colour or similar to dark-amber, a sweet and velvety flavour and at least 13,5 degrees; it's a typical dessert wine, but can also be with cheese and for "metidation". The great wines of Piemonte are not from Turin, but it is a great booze: the vermouth. Infact, although the name comes from the German "assenzio, bitter", the booze has indeed Turin's origins. Infact, vermouth is a "tricked" wine with herbs and spices, and has on the contrary ancient origins: the first testimony of its existence dates back to the 400 b.C. and in the ancient Greece the drink was largely widespread. In the Middle Age the aromatical wine enriched of spices which came from the far East and, later, from the South America. The first italian capital of aromatica wine production was Venice, but the region of Piemonte (and especially Turin) became the international landmark because the herbs and the aromas of the Alps and the dry wines production gave a notable advantage. The tradition tells that in Turin the vermouth has been invented in 1786 in a small workshop under the Porches of a current piazza Castello (Castellos Square), Mr Marendazzo's property, whose helper was Antonio Benedetto Carpano. This boy, who arrived in Turin from Biella, liked the muscat wine very much, and decided to obtain an aromatical wine, by adding herbs and spices of his valley, according to ancient recipes learned from some friars. It was in this way that vermouth was born, and the small workshop became soon a meeting place for Turin's inhabitants, who were enthusiastic of the new aromatical wine; even the duke Vittorio Amedeo 3rd appreciated the new wine so much that he proclaimed it "court's aperitive". Carpano's recipe was just a variation of the ones which were already far-back known from Turin's producers, but it was the first which gave the impulse to the great production of Italian Il bisogno d'affetto è notevole, anche se non amate darlo a vedere in uno stile zuccheroso. La capacità d'amare diventa dedizione, fedeltà, intelligenza messa a disposizione dell'altro in una visione del rapporto quasi tradizionale in un mondo che sembra andare avanti a spintoni e gomitate. La forma, che spesso mettete in campo nei rapporti, diventa poi confidenza, sensibilità, appassionato attaccamento. Sarà per questa profondità che le vostre partenze d'amore sono così prudenti. In 19th century the great vermouth producers began to export their product, firstly to Europe and then to America; still today the vermouth is the 25% of wine Italian exports in the world. And now some suggestion. Eat the typical antipasti, either cold or warm, with Freisa, a wine characterized by delicate fragrance produced from 17th century on the hills surrounding Turin. Choose Erbaluce di Caluso, white wine with fruity perfume, together with the first dishes fresh pasta based (for example the agnolotti) and fish as a second dish; with meat and game, try red wines with strong flavour, as Barbera and Bonarda. If also desserts want their wines, we give you an advice: choose the sweet, perfumed and excellent Malvasia; for the discriminating tastes, we advice instead to try the velvety flavour of the white Caluso, especially with stuffed pies and zabaione.